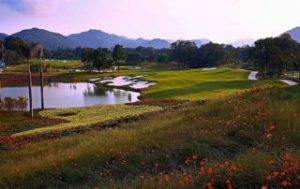 Zhuhai Lakewood Golf Club, a 36 holes golf course built in year 1996, was awarded as one of the ten (10) most influential golf courses in China. The course is situated at Guangdong Zhuhai, a region with tropical and moderate monsoon. The rainy season scatters around April to September each year with annual evaporation rate of 67 inches (1,700mm) vs. the rainfall amount of approximate 79 inches (2,000mm). As a consequence of the over-evaporation, the water demand in the region becomes critical. In order to replenish the shortfall of water for the golf course, a transfer of water at the annual capacity of 30,000 tons to 50,000 tons from other regions is demanded to meet the sustainable requirement of water supply. The existing aging irrigation system installed at the premises is deteriorating. Housekeeping and maintenance of the irrigation system is quite substantial. Since 2014, the upgrade and renovation of the course began with the ultimate target to host a high standard golf course for tournament. To align with the objective, the management planned to redesign the landscape, replacement of lawn, upgrading of drainage and update of the irrigation system. Due to the drought during the dry season, there was high hope that the new irrigation system would enhance the water conservation, efficiency, economy and reliability of the system. With the new design of the irrigation system, flexibility and maintenance reliability were expected. As the project was fast moving the newly completed irrigation system needed to be operational in order to cope with the replacement of lawn at the accelerated pace. The construction was finally completed in advance covering the entire 36 holes at the early stage, and eventually the early completion of the entire project. The installation of the Rain Bird IC system was started in September 2014 and began operation right after the water jet nozzles of the first two golf courses was completed. This early operation of the IC system had provided the most flexibility and convenience to the users. The new irrigation system with nozzles from Rain Bird was proven seamlessly compared to the traditional system. The deployment of IC system with high sophisticated control and water spraying which was finely controlled to meet the best optimization of irrigation without over-irrigating or under-irrigating meaning providing high achievement of water conservation. Since the implementation of the new system in 2015, transfer of water from other regions was no longer required. A substantial savings in operational costs provided by the high flexibility of water supply internally. After the completion of 21 holes, a two years statistical analysis (Oct 2015 to Oct 2017) indicated a savings of 45% water consumption, a further saving on water consumption was anticipated after the total growth of lawn. The deduction of water consumption at 25% was also recorded comparing to other golf courses in the region. 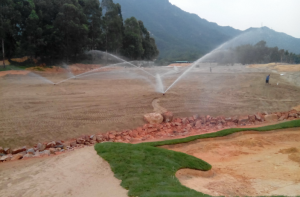 Zhuhai Lakewood Golf Club was now the most water saving golf course in Guangdong province. The operation team had quickly adapted to the system after one-week application. The change of operational concept based on the Rain Bird IC system with simple basic operation mode. The command to individual water jet nozzle rendered the direct control to eliminate unnecessary human error. The pursuit of installation of remaining 15 holes golf course speculated further 30% saving on water consumption. The applause and aspiration to the grand completion of the IC system.